Chateau Saint Roch has been an active property in Chateauneuf du Pape for quite a while. In 1955, the estate, located in Roquemaure was purchased by the Verda family. In 1998, the Verda family sold the vineyards to the Brunel family. The Brunel family are a well-known, established family in the Southern Rhone Valley as they have owned and managed the popular Chateau de la Gardine since 1948. Ere Brunel, who is the wife of Patrick Brunel, is in charge of the estate. She is in charge of making the wine at Chateau Saint Roch. The vineyards of Chateau Saint Roch cover 2 hectares in the Chateauneuf du Pape appellation. Chateau Saint Roch produces 1 Chateaunef du Pape Rouge wine. Chateau Saint Roch is made from a blend of 55% Grenache, 22.5% Mourvedre and 22.5% Syrah. On average, the vines are more than 30 years of age. The grapes are destemmed. Vinification takes place in cement tanks. 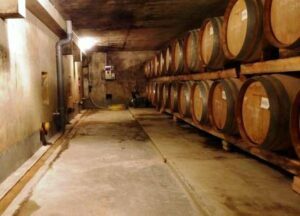 The wine is aged for 12-14 months before bottling in a combination of used French oak barrels and cement vats. The production of Chateau Saint Roch is on average, 600 cases per vintage. Chateau Saint Roch can be enjoyed on the young side. Young vintages can be popped and poured, or decanted for about 1 hour, give or take. This allows the wine to soften and open its perfume. Older vintages might need very little decanting, just enough to remove the sediment. Chateau Saint Roch is usually better with 2-4 years of bottle age. Of course that can vary slightly, depending on the vintage. In the best vintages the wine should be consumed within 3-10 years after the vintage. Chateau Saint Roch is best served at 15.5 degrees Celsius, 60 degrees Fahrenheit. The cool, almost cellar temperature gives the wine more freshness and lift. Chateau Saint Roch is best served with all types of classic meat dishes, veal, pork, beef, lamb, duck, game, roast chicken, roasted, braised, stewed dishes, sausage, barbecue and cassoulet. Chateau Saint Roch is also good with Asian dishes, hearty fish courses like tuna, mushrooms, pasta, eggplant, cheese and tomatoes. Chateau Saint Roch also produces red and white wine from 36 hectares of vines planted in the Cotes du Rhone and Lirac appellations. Polished, and sweet, the wine is medium bodied, fresh and loaded with lush, cherries and olives. Forward, round and ready to go, this is already fun to drink. Sweet and silky, this medium bodied wine delivers freshness in its cherry and plum finish. Produced from 40% Grenache and equal parts Mourvedre and Syrah, the wine reached 14.5% alcohol. Fennel and garrigue, complicated by spearmint and red berries develop into a soft, medium bodied, spicy, red kirsch filled wine. Easy drinking, medium bodied, kirsch and herb filled wine with an earthy, spicy, cherry finish topped with licorice notes. Forward, lush, spicy peppery and ripe, with loads of juicy, sweet, fresh, round, red cherries, licorice and herbs.